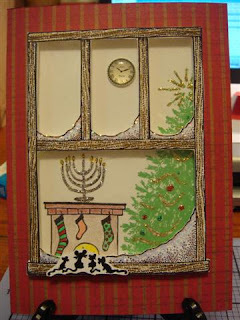 A coworker of mine (Rachel L.) asked me to do a card that celebrated both Hanukah and Christmas. Not that easy to do - but I like the way this turned out. On white cardstock I stamped the Fireplace 2-2057E from www.amuseartstamps.com, the menorah (company unknown), and the Xmas tree 96847-P from www.inkadinkado.com. On another piece of white cardstock I stamped the window frame (www.toomuchfunrubberstamps.com), cut it out, colored it in, covered it with acetate, and then, using long strips of double sided tape, applied it over the other image. It sits about 1/4" above the image. Then pop dotted the mice (Viva Las Vegas). 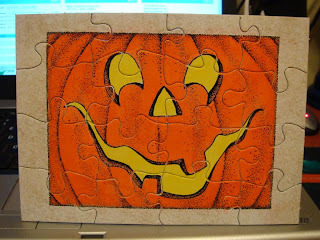 This is a very simple card to make. The branch is Ponderosa Pine Y013 from www.stampendous.com. Then I stamped the ornament from www.outlinesrubberstamp.com - H183, cut it out, put some gold stickles around it, then stamped the mouse on the inside - Mouse Bauble H0004 from www.elzybellsna.typepad.com. This image of the African American woman is called Pearls II from Coronado Island Stamps (www.cistamping.com). 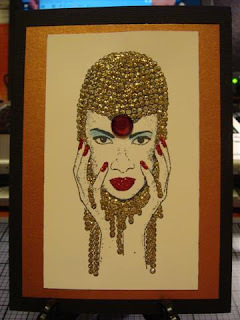 I used gold stickles in her headpiece, a little blue chalk on her eyes, and red glitter on her fingernails and lips. 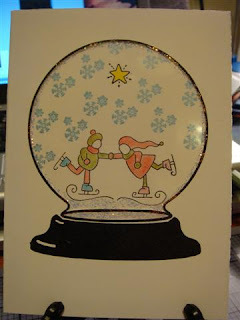 Snowglobe images from www.judikins.com (think they are retired). 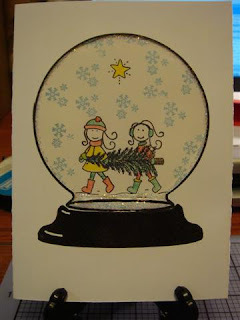 The 2 girls holding the tree is Girls With Tree E0002 from Elzybells (www.elzybellsna.typepad.com), the snowflakes and star are from Holiday Snowglobe, 2425R, from www.plaidonline.com. Snowglobe from www.judikins.com (think they are retired). 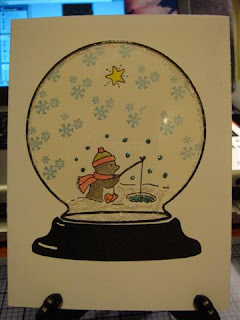 Fishing Penguin, E0029, from Elzybells (www.elzybellsna.typepad.com), the snowflakes and star are from Holiday Snowglobe, 2425R, from www.plaidonline.com. Snowglobe from www.judikins.com (think they are retired). The skating couple is from the Winter Wonderland set T2585 by The Angel Company (http://trent.ismyangel.net), the snowflakes and star are from Holiday Snowglobe, 2425R, from www.plaidonline.com. 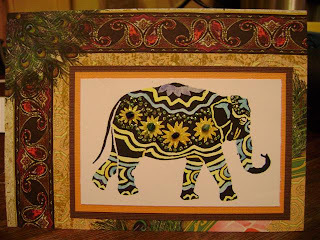 This is another card I made using the India papers from www.doveoftheeast.com. The elephant image is from www.stampfrancisco.com. 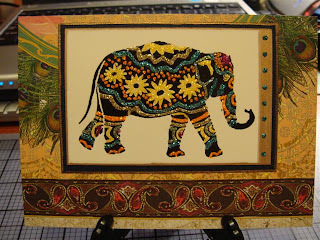 I stamped the elephant in black pigment ink, clear embossed, and then colored in using Ranger's Stickles. 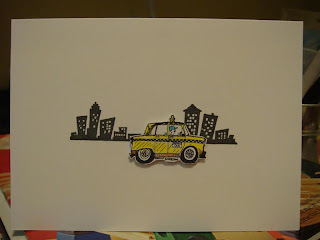 Here is a cute little card I did. 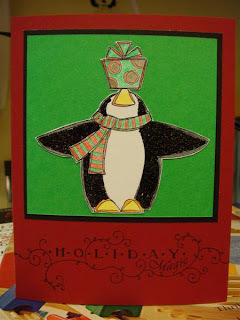 Stamped the penguin (Chillin Penguin, 60083, www.stampshappen.com) on white card stock. Used black sparkle glitter. Cut him out. Layered him on green cardstock, then black, then the red card. The Holiday Magic message is from The Angel Company (http://trent.ismyangel.net). So, I have a thing for pigs. And Christmas. 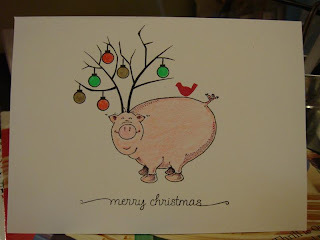 Here is my version of a Christmas pig. LOL. The pig image is 93909M (www.inkadinkado.com), the antlers, small bird, ornaments are from Memory Box Stamps. The message is from Hero Arts. Colored using Prisma pencils. 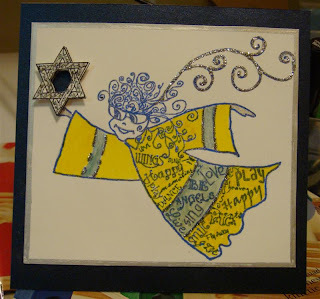 This is a Hanukah Card I made using images from Jen Lowe (http://jenlowedesigns.com/LMC/Lucy_stamps.htm). Used glitter and H2Os. 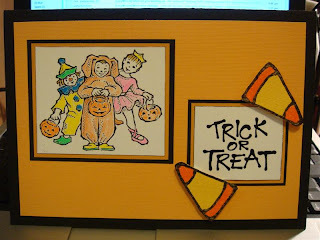 Another cute and easy card to make. Stamp the frog from Viva Las Vegas, color with green Prisma pencils and add 2 googlie eyes from Darice. 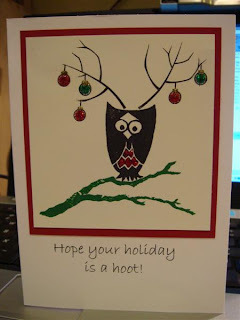 Then stamp the message, Happy Holidays from www.amuseartstamps.com. 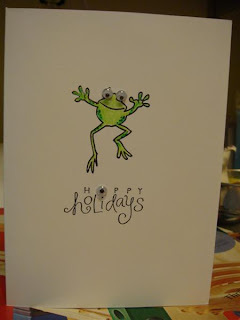 I added another googlie eye in place of the "a" so it spelled Hoppy Holidays. Another easy card to make. Stamp the Floating Ice (E-PSH061 from www.sundayint.com) and color with glitter. I then stamped the polar bear (F-7481 Knut from www.thecatspajamasrs.com) on top of the floating ice. 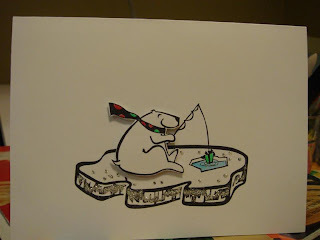 On another piece of white cardstock, I stamped the polar bear again and cut him out. Colored his scarf in and layered it with pop dots. Same card as below but without the Lady Liberty stamp. This would work for any city other than New York City. 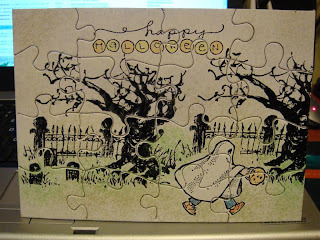 This was such a fun and easy card to make. I stamped the Cityscape image (www.stampendous.com), masked the left side and stamped Lady Liberty (www.amuseartstamps.com) over it. 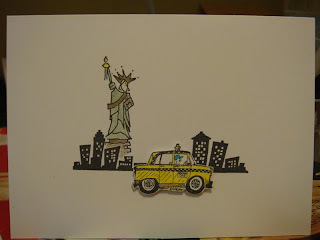 Then I stamped the taxi (from American Art Stamps), cut it out and layered it on top of the cityscape using a pop dot. 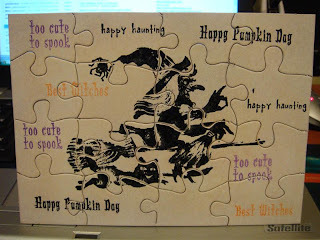 This is a card I did for a swap I was in. Had to do 8 of them. Fun but time consuming. Stamped image (Holiday Pear Collage, 3429R, http://www.rubberstampede.com/) using Stazon black ink onto the smooth side of an acetate sheet. Trim. Turn over and, using alcohol inks, colored in the different areas of the image. Gold on the star and pear, some greens on the holly leaves, reds and greens over the rest. Layered on gold paper, which was layered on red cardstock, which was layered onto the card. 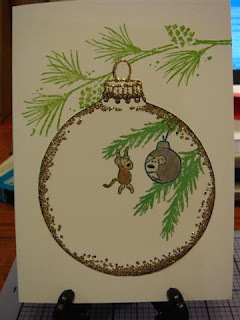 On the front of the image I used Stickles glitter glue to highlight certain areas of the card. This is an indian themed card I made. 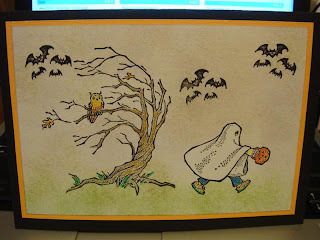 The paper is from www.doveoftheeast.com. The stamp is called Painted Elephant Large from www.stampfrancisco.com. I used archival ink, watercolor crayons, added some stickles from Ranger on the flowers and the spots surrounding the flowers, and a bead in the center of each one. 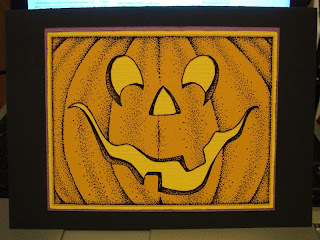 Layered it on the Fall Cardstock colors from DCWV. 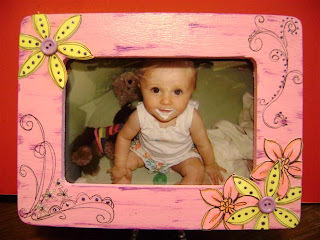 This is a photo frame I made for my niece, Abigail. She is turning "1" on September 8th!! Boy, how times flies. The frame itself is an unfinished frame from Michael's, which I painted with Ranger's daubers using Pink Sherbet and Raspberry. The stamped images are from Stampin Up's "Doodle This" and "Delight In Life" sets. I stamped them on white cardstock, colored with Lyra's Watercolor Crayons and adhered to the frame. The flourishes I stamped right over the paint. Some buttons, glitter, and a few layers of Mod Podge, and it's done. 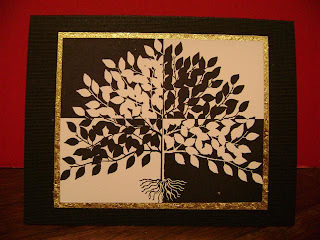 I call this card the Tree of Life. 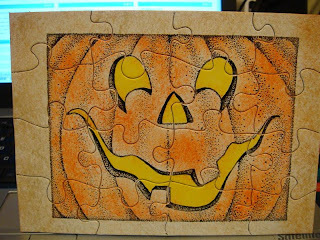 The image is from Just For Fun (http://www.jffstamps.com/). 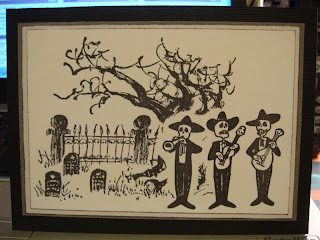 I stamped the image on white cardstock with archival black ink. Layered it on a piece of double sided sticky paper. Rubbed gold leaf flakes on the edges of the sticky paper. Adhered it to black textured cardstock by DCWV. 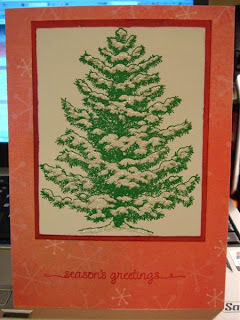 I also cut a piece of white paper and adhered it to the inside of the card in order to write something.